If you are short of time, you can just scan through the highlights (images) below. 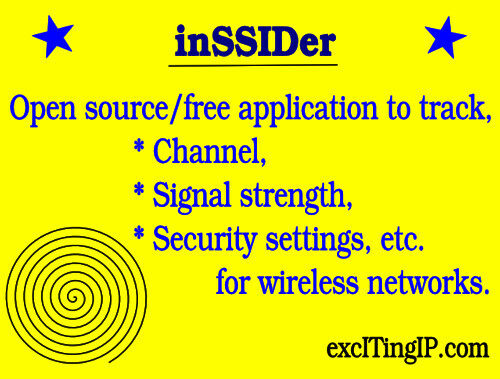 inSSIDer is an open source/free software application developed by metageek that allows you to scan and track the signal strength, channels, security settings, etc. of your wireless network, as well as other neighboring wireless networks in your range. This tool is most useful for homes and small businesses that are located in shared premises where many wireless networks overlap, and might interfere with yours. Why should I track my Wi-Fi network? Isn’t it enough if I am able to successfully connect with my Wi-Fi router/AP? In many cases, plug-and-play setup might be sufficient. But, if you are living in an area where there are many neighboring Wi-Fi networks or if you are experiencing dropped connections and low-speed, you might as well check if the problem is due to Wireless Interference. For that, you need a tool to track or scan for all the nearby wireless networks and their wireless channels. You might be familiar with 2.4 Ghz and 5 Ghz channels, advertised by Wi-Fi vendors. But this represents the spectrum or group of channels over which the Wireless AP or Router can work. In practice, each router/access point associates with all the devices accessing it on a specific frequency or channel, within that spectrum range. In the 2.4 Ghz spectrum, 2.412 Ghz and 2.417 Ghz are examples for individual channels. 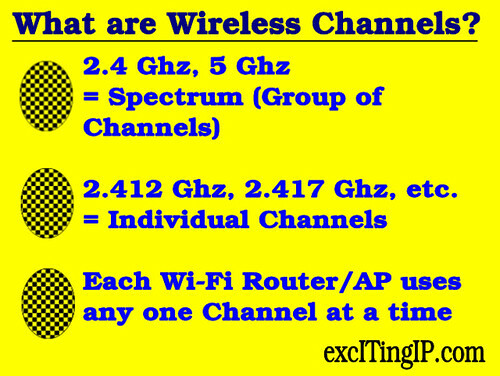 Refer here for more info on Wi-Fi channels. Fine. But how is interference caused? 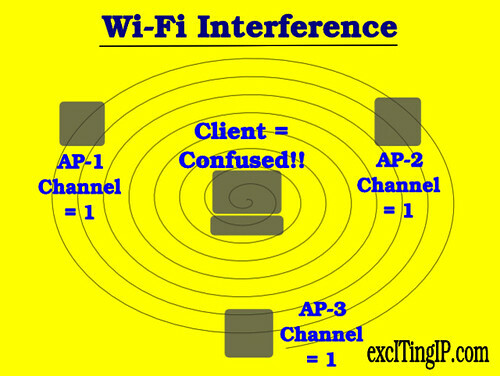 Interference happens when two wireless routers/access points (that are nearby) are operating in the same channel. This can happen more often than you think because many people don’t change the default channel of operation. This is the reason why it is important to check what channel your router/access point is operating in, AND what channel its immediate neighbors are operating in. 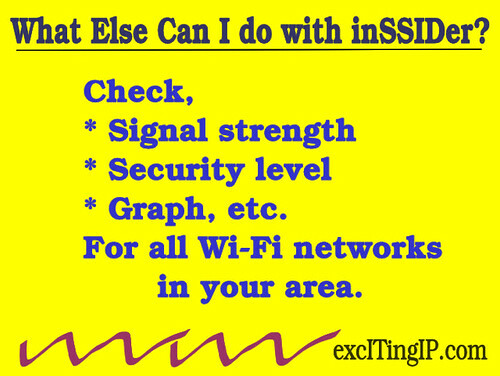 inSSIDer helps you to do this. O.K. What can I do after I observe the channel info? If you find two or more nearby Wi-Fi routers operating in the same channel (specified by numbers – 1,2,3, etc.) as yours, change the channel of your Wi-Fi router to a number that is far away from theirs. If possible, you can ask them to change their channel of operation, as well. For more info on changing channels, this article might be helpful. Interference is a bigger problem in the 2.4 Ghz band. This is one reason why it maybe better to buy routers and clients that support 5 Ghz and use that band for Wi-Fi connections. 5 Ghz has more non-overlapping channels (and offers higher performance) than 2.4 Ghz. What else can inSSIDer help me to do? Among other things, you can determine the signal strength your Wi-Fi connection and compare it from various locations. You can also see the signal strength of other wireless networks (nearby), which will help you guess how close they are. You can check if your wireless connection is secure – do check if your connection is shown as WPA2 (which is the most secure). You can also see a graph with signal strength on the x-axis and time on the y-axis for all the Wi-Fi networks near you. Great. What are the Limitations of the Free Version? You can see the differences between inSSIDer for home and inSSIDer for office, and download the home version from here. The manual (pdf) is here. For a home/small business, the free version should be sufficient. Also, this tool is offered only for Windows and Mac-based systems. You could stay up to date on the various Computer Networking/IT technologies by subscribing to this blog with your email address in the sidebar box that says, ‘Get email updates when new articles are published’.